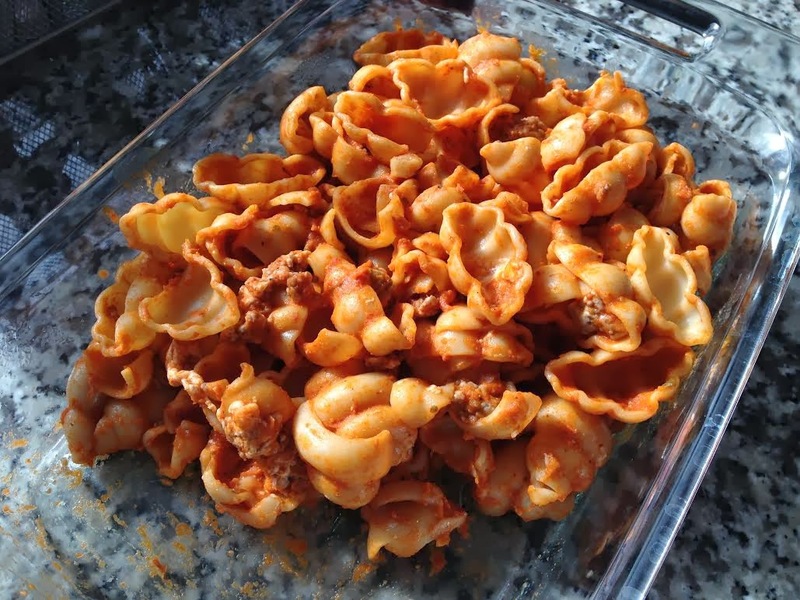 Stove Top Baked Pasta with Mozzarella, Tomato Sauce, and Sausage - presented in a casserole dish but made on the stove top. We are great fans of the baked pasta concept and whether it’s lasagna, pasta al forno, or cannelloni we can’t imagine a better way to prepare pasta. However, baked pasta requires two steps; namely, cooking the pasta and thereafter baking the pasta along with cheese, ricotta, tomato sauce, etc. 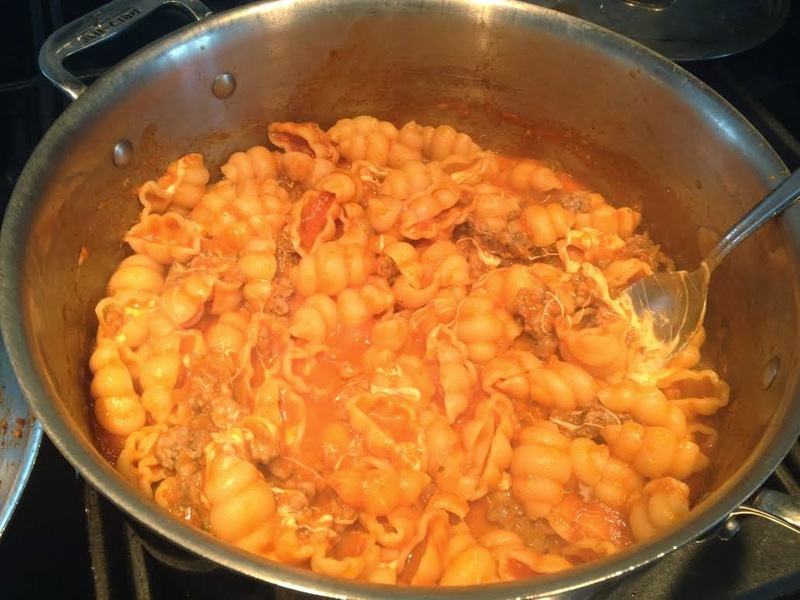 If a two step pasta dish isn’t in your playbook or weeknight timeline but you still desire the baked pasta flavor, then skip the baking and simply combine the ingredients in a large pot on the stovetop. The key to our Stove Top Baked Pasta with Mozzarella, Tomato Sauce, and Sausage dish is to cook your pasta (preferably a short pasta shape such as penne, rigatonoi, ziti, etc; we used De Cecco’s shape entitled “Gnocchi”) al dente and then combine the cheese, meat, tomato sauce, and pasta in a large pot (making sure the pot has a medium flame) until melted cheese perfection is achieved. 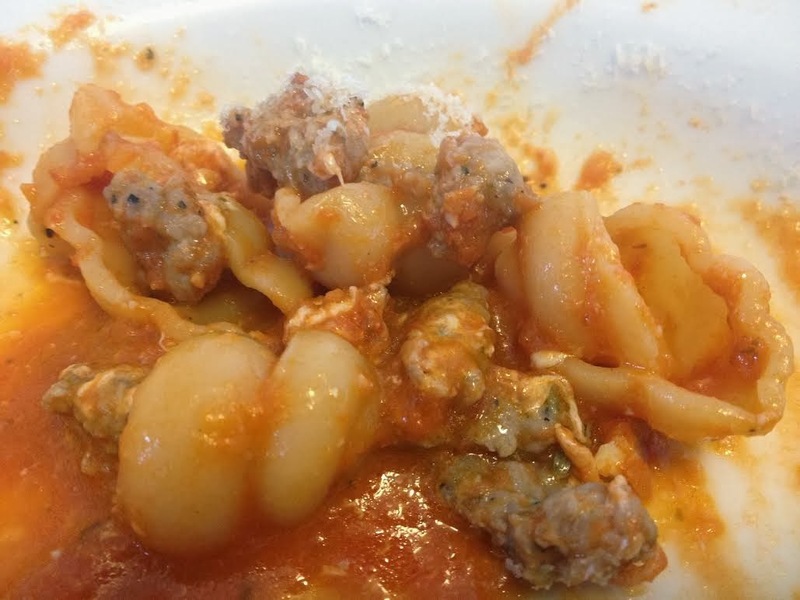 Using the best quality dry pasta you can buy will ensure wonderful results, as would using a homemade mozzarella and sausage from a reputable Italian market. 1 pound of any short pasta shape (we used a De Cecco shape called, "gnocchi"
Cook the pasta al dente. In a small fry pan, remove the sausage from the casing and cook for 15-20 minutes or until sausage is broken down and crispy. In the same pot that the pasta was cooked in, add the tomato sauce and then the pasta - keep a low to medium flame going. After 3-5 minutes, add the mozzarella and stir well. Add the grated cheese and stir well. Add the basil and sausage and stir.